So, this post may get a little ranty, you've been warned. When I initially submitted my application to go to culinary school I made sure to be up front and tell them that I had no desire to work in a restaurant. I understood that an externship with a restaurant was required to complete the course, but I was pretty clear that I did not want to work in a kitchen. I kept an open mind through out school, and every time externships were brought up I listened. My class was told to keep our minds open, and to be flexible. I decided to do as they said, and go with the flow, after all; these people knew me! I'd been going to school and seeing them for 16 weeks. I'd taken about 10 of their recreational classes. I felt like they were going to help place me in a great spot. I'd also been vocal about my love of baking - I took a batch of cupcakes to class with me once a week. So in my first meeting to discuss my placement we talked about the possibility of me working somewhere with a good chance to work with pastry. I made sure to let them know that I could work any day of the week, any time of the week but that I didn't want to work really long hours (I can get irate when tired.) and I didn't really want/care about making Italian food, and I didn't want froufrou. I was surprised to say the least when I was told I'd be working with Flour + Water/Central Kitchen. Don't get me wrong, these are both great restaurants but I hadn't even considered them because Flour + Water is all Italian pastas/pizzas, and Central Kitchen has some pretty froufrou food. I stewed about it all weekend, as we'd been told on a Friday. I was angry, confused, and felt like I'd been betrayed by the school and the people who were suppose to be taking care of me and looking out for my best interests. I went in early that next Monday so I could talk about the choice. I wanted to know why they thought these restaurants would be the place for me. I was told that I was placed there because I could do whatever I wanted there. This was appealing to me, but at the same time I was sad that I wasn't going to be playing with a place known for their desserts. I talked myself into the externship and continued on with school. On May 7th I started at Central Kitchen. No one knew I was starting that day, despite my having worked it out in advance. Even the guy in charge of me had no idea I was even starting at all. (That's always a great feeling.) I butchered 25 chickens on my first day of my externship. I butchered another 25 that Friday. I really enjoyed everyone I worked with at Central Kitchen/Salumeria - I never made it over to Flour + Water but that was my choice. I reported to Travis Day, the resident butcher and one of the sous chefs, who is pretty fantastic and let me plan my own schedule. Pat Evans, the other Sous Chef, was always awesome and helped me with anything I needed. Together Pat and I pickled a bunch of beets and various other vegetables. I think one of my favorite things Pat said to me, which happened to be while we were pickling was, "We're just going to punch it down until it pisses out all the liquid." That statement was in regards to a batch of "Spring-chi" or a weird mash-up of kimchi if-you-will. Chicken feet! These get boiled and then added to stock. 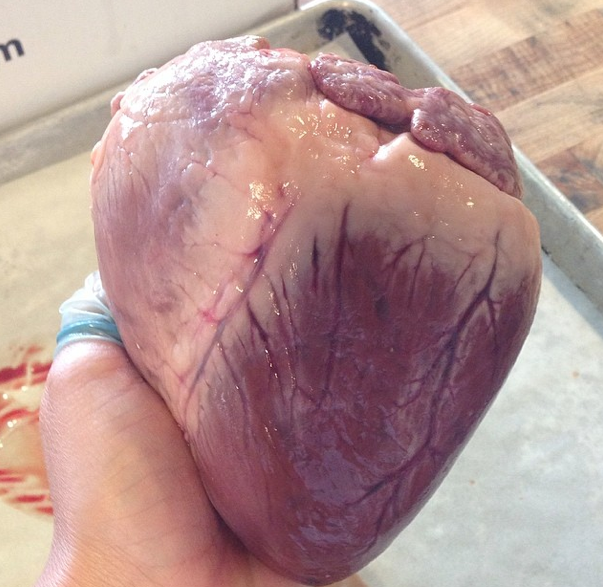 This is a pig heart. Every Wednesday Travis would break down a pig. 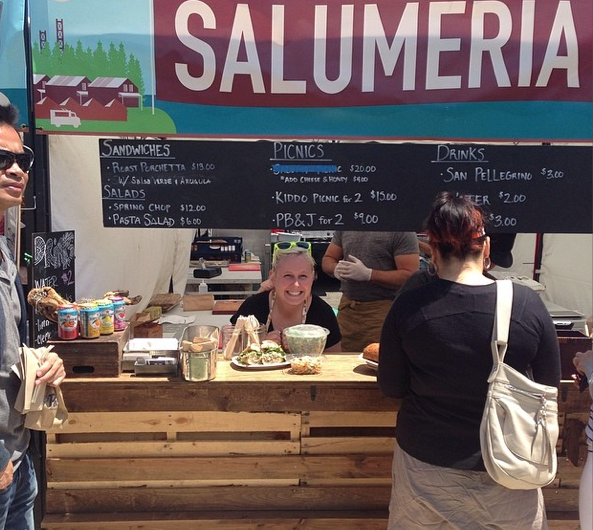 I got to help with Off The Grid in the Presidio! Emily, Aly, Brian, Bryan, Nate, Garrett, Armando, Eric, Kevin, Chad, Freedom, Alex, Andrew, and a whole raft of other wonderful people helped me finish my externship, and make it through relatively unscathed. The people at Central Kitchen are great and were very happy to be working in such a great place. It was the people who made my externship enjoyable. It was the people who kept me going back and actually finishing my program. I respect anyone who works in the food industry, it's a labor intensive long haul; that said, I didn't need to work in a restaurant to know that. I'm glad that I went in honest and let Chef Ryan know that I was there to get the job done, and then be on my way. I finished my 240 hours of externship in five and a half weeks and on Sunday June 29th I graduated from San Francisco Cooking School. Since the end of school I've helped with a couple of classes at the school, and have been trying to finish up my extracurricular classes. Each student is/was suppose to complete 30 hours outside of class whether it be TAing, Volunteering, or taking other "approved" classes. (This is where things get really ranty.) I have no idea how many hours I've completed, I have an idea but am still not sure if everything is done. I have a sneaking suspicion I have more hours, but honestly no one has let me know what classes I could take, or if there's a spot available. I desperately tried to take the "Summer Preserves" class, as it would really go great with my cupcake baking, but I was told that it would not count as we had pickled vegetables in class and it's the same thing. It is absolutely NOT the same thing, yes it's about preserving but pickling and canning are two completely different techniques. It was really disappointing to not be able to take a class like that as a credit. Don't worry, I took the class anyway and it was great, taught by Kim Laidlaw, and learned so many things. It's mostly disappointing that classmates of mine were able to take an ice cream class that counts for credit when we made ice cream on a regular basis during our program, but that I couldn't take the preserves class. In retrospect I wish I had been more pushy before graduation to learn what was available for me in the future as a class credit option. I understand that the school is not only a school but also a business and that they need to make money, but I feel as a student that as soon as I was done with graduation I was no longer any of their concern. I don't expect hand holding, but I do respect honestly and reasonable answers. I'm happy I went to culinary school. 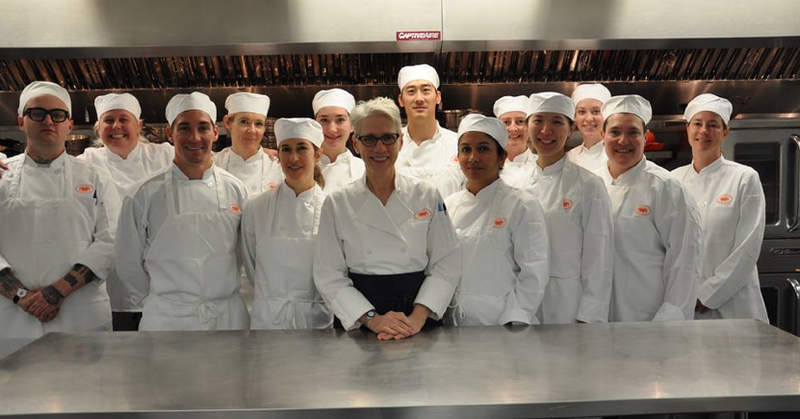 I had a wonderful time in class with all my classmates and the great Chef Catherine Pantsios. I was able to expand my culinary knowledge and technique, and every day was a food adventure. Currently I'm in the final stages of setting up my own cupcake catering business. Thanks to California's Cottage Industry laws I can bake out of my home. I'll keep you posted on how things are going.